Another HOT Glade coupons and this one I guarantee won't last the day because it makes for a FREEBIE at Walmart. Glade Expressions Fragrance Mist is priced at just $2.98 each at Walmart. 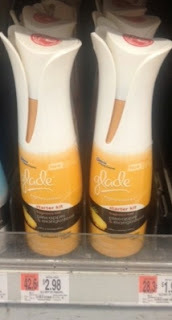 Use the $3.00/1 Glade Expressions Fragrance Mist coupon to score these for FREE. Don't forget you can print this twice.